The study examined how changes in temperature, clouds and rainfall affect the number of flowers that tropical forests produce. Results showed that clouds mainly have an effect over short-term seasonal growth, but longer-term changes of these forests appear to be due to temperature. While other studies have used long-term flower production data, this is the first study to combine these data with direct estimates of cloud cover based on satellite information. The results of the study, "Clouds and Temperature Drive Dynamic Changes in Tropical Flower Production," was published July 7 in the journal Nature Climate Change. "Tropical forests are commonly thought of as the lungs of the earth and how many flowers they produce is one vital sign of their health," said Pau, an assistant professor in Florida State's Department of Geography. "However, there is a point at which forests can get too warm and flower production will decrease. We're not seeing that yet at the sites we looked at, and whether that happens depends on how much the tropics will continue to warm." U.S. Geological Survey Senior Scientist Julio Betancourt, who was not involved in the study, described Pau's research as "clever." "It integrates ground and satellite observations over nearly three decades to tease apart the influence of temperature and cloudiness on local flower production," Betancourt said. "It confirms other recent findings that, in the tropics, even a modest warming can pack quite a punch." Pau led a team of international researchers who studied seasonal and year-to-year flower production in two contrasting tropical forests -- a seasonally dry forest on Barro Colorado Island, Panama, and an "ever-wet" forest in Luquillo, Puerto Rico. The seasonally dry site, according to Pau, has been producing more flowers at an average rate of 3 percent each year over the last several decades, an increase that appears to be tied to warming temperatures. "We studied flowers because their growth is a measure of the reproductive health and overall growth of the forests, and because there is long-term data on flower production available," Pau said. The amount of sunlight reaching tropical forests due to varying amounts of cloud cover is an important factor, just not the most important when it comes to flower production. 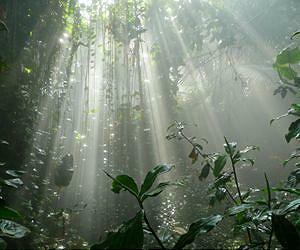 "Clouds are a huge uncertainty in understanding the impacts of climate change on tropical forests," Pau said. "Both sites still appear to respond positively to increases in light availability. Yet temperature was the most consistent factor across multiple time-scales. "With most projections of future climate change, people have emphasized the impact on high-latitude ecosystems because that is where temperatures will increase the most," Pau said. "The tropics, which are already warm, probably won't experience as much of a temperature increase as high-latitude regions. Even so, we're showing that these tropical forests are still really sensitive to small degrees of change." July 10, 2013 — Spurred by increasing levels of atmospheric carbon dioxide, forests over the last two decades have become dramatically more efficient in how they use water, a Harvard study has found.